We’ve been fans of Ina Garten since we first saw her show, Barefoot Contessa, on the food network. Her recipes are simple to follow and emphasize flavor. The way I see it, if you are worried about calories, eat a smaller portion or make it less often. This apple crisp recipe is based on Ina Garten’s “Old Fashioned Apple Crisp” recipe from her book, Barefoot Contessa Parties! The first time my wife made this we knew we would be making it again and again. 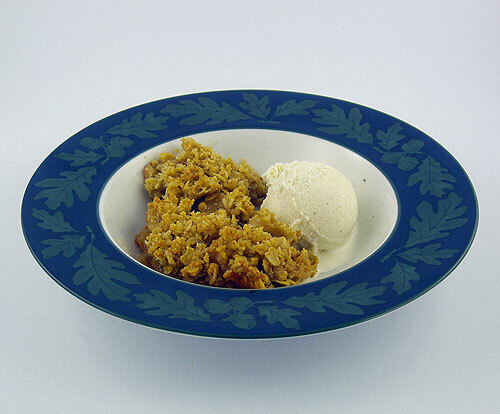 What sets this apple crisp apart from your average apple crisp is the presence of orange zest and nutmeg. We reduced the orange zest by half to keep the orange presence a little more subtle. Since we prefer Meyer lemons, which are not as sour as most lemons you find at the store, we doubled the amount lemon zest called for. We substituted Granny Smith apples for McIntosh apples since we like a tart crisp. We have been making this recipe for several years now and even made it in a dutch oven while camping in Yosemite. We couldn’t get the crust to be crispy like it gets at home, but I think on our next camping trip we’ll experiment with more coals on top. Baked in a regular oven, the topping is crispy and remains so even after refrigeration. 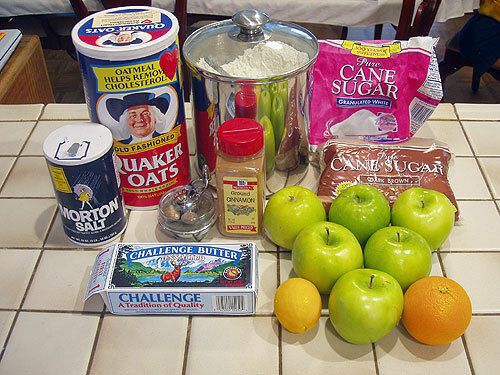 Ingredients for making Apple Crisp. 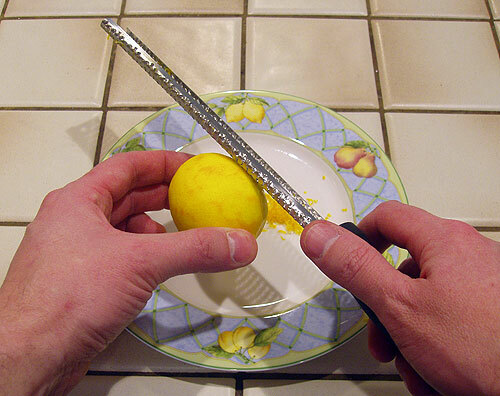 Finely grate the rind of two Meyer lemons. 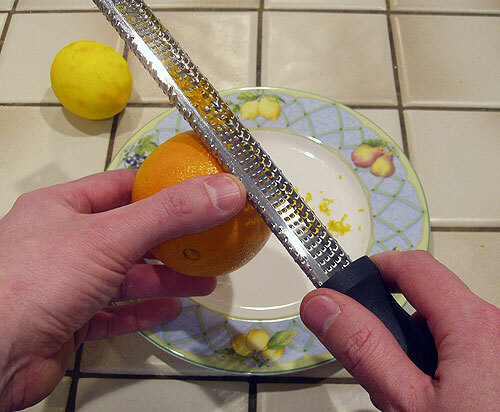 Finely grate the rind from one orange. 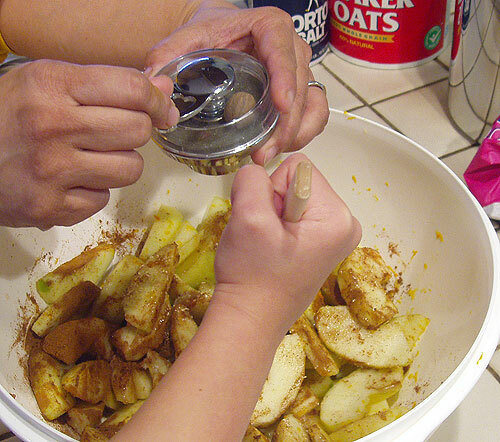 Add freshly ground nutmeg to apple mixture. 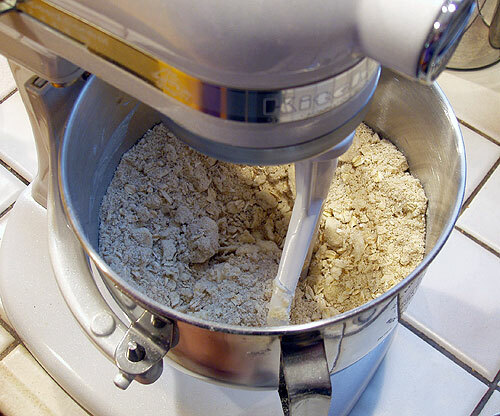 Mix topping ingredients slowly to reduce chilled butter cubes to pea sized chunks. Bake until topping is golden brown. This quick and easy recipe is great cold, but it is best enjoyed served warm with a scoop of vanilla ice cream. 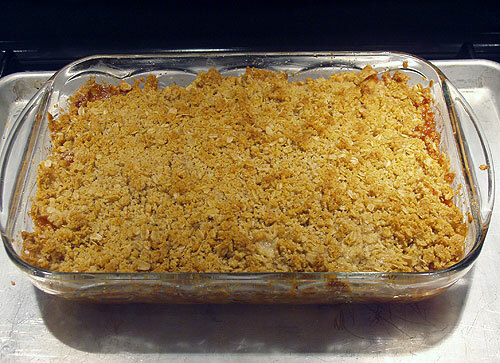 The recipe, with detailed instructions and complete photo gallery, can be found on the Apple Crisp recipe page.